Currently, there are many grassroot revolutions taking places and they are scattered and not well orchestrated. USL1 (as a biggest human capital revolution trigger thus far) is trying to maximize the harmonious impacts with the Renewable Energy (Energy and Environment), Restorative Organic Agriculture (Food and Environment), and the Circular Economy (Resource and Environment). Together, we will be able to resolve almost all 12 global transition targets by 2035-40 if the UN-led URF1 materializes. We are to revolutionize the Social Capital (to empower the poorer half and the farmers and cuts off the income inequality radically) and the Nature Capital (to preserve the ecosystem balances) not at the expense of Financial Capital (as the traditional economic practices tend to alienate both very much) by revolutionizing Human Capital with USL1 and using USL1 revolution as a bait for the unprecedented Financial Capital growths that decouple from the sacrifices of the Social and Nature Capitals. So the Human Capital revolutions will trigger the cascades of the revolutions in all other forms of Capitals, especially if the UN-led URF1 treaty is binding and materialized. USL can make the average students learn 12 years of school math in less than 0.5 year, but the ordinary people have been too skeptical as most cannot handle this kind of massive potential. So we currently push only up to USL1 (1.0 which will push forward the two of our quasi-Moore´s Law for Economy and Population growths), but it still has the cosmological economic and population consequences. USL1 alone will induce the biggest global GDP (per capita) growth changes in history over the next 20-30 years alone because USL1 will more than halve the doubling time for the GDP growths (or GDP per capita) roughly speaking for the majority of countries. USL1 can also roughly more than double the population doubling time, which means that we can reduce the pulation growth rates to roughly to half for most countries. To resolve the top global challenges mostly as bonuses instead of getting bogged down and shackled by the typical endless divide & conquer rhetorics, schemes of the left vs. the right, Capitalism vs. Communism/Socialism, climate alarms vs. climate denials, Neoliberal vs. Noe-conservative, etc to oblivion. Instead of arguing, we will simply execute the key common ideas and before we know it, we will resolve all the challenges very rapidly. To resolve our toughest top 5 global crises is like an inevitable love story. USL1 and URF1 together can make this happen. USL1 alone can change the history the way it is, but without its partner, it is like a Pandora´s box only to be tamed by URF1 for which we desperately need your help and hope to raise the awareness of the USL1-5UE-URF1 proposals we are making. USL1 is designed to trigger major global transformations. It was created to trigger its induced human capital aided rapid solutions to the top 5 toughest global crises that will cost 4-10x larger than the entire annual world economic size, e.g. the total world (nominal) GDP, which will cost about 300-750 Trillion USD (and the transition to 95% Renewable Energy alone is expected to cost 100-220 Trillion USD that is 1.5-3x larger than the current entire world GDP) which means the average earthlings – us – need to pay the average 7-20% of the national economy (GDP) for over more than half a century. No country on earth can handle this right now, possibly except China in 10 years. But USL1 alone can shake up only education, economy, and the population growth, but this urgently needs his counter-part, his spiritual wife, called URF1. URF1 is to use a portion of the cosmological surplus gains of the annual GDPs to resolve the environmental, energy, and resource as well as the social crises. URF1 cannot exist without the efficiency of USL1. USL1 alone cannot take care of the rest of the environmental and social issues So it urgently tries to find his spiritual wives from every country, NGOs, and the UN. USL starts as a set of the biggest breakthroughs in Math & Science Education, but as a human capital, its potential economic impacts will be far larger than anyone has suspected. USL1 – although using only 20% of the full capacity of USL (Unified Super Learning) – can literally induce the cumulative surplus world (nominal) GDP of 2.5x larger than the current world economic size in 10 years, 10x larger in 20 years, and 40x in 30 years as a colossal human capital booster after 2-4 years of reforms to go globally (starting with the willing governments first and then the UN). NOTE: the evidence documents for the top 5 global crises, their costs, and details as to how this is done is currently updated frequently on our BOEC Working Paper series. First our 2.5 minute quick bite for the USL1-URF1 plans. This video is from mid-2014 and doesn´t cover the slowing down of the population issue as it was developed in January 2015. 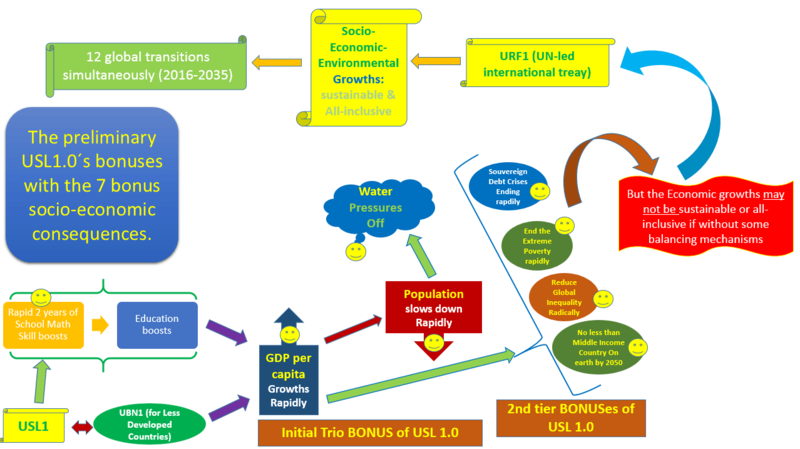 High pitch: USL1-URF1 are designed to resolve the Top 5 global unsustainable challenges/crises which will cost $400-850 Trillion USD, which will require 8-20% of the average world GDP annually for the next over a half a century (but with the USL1-URF1, they can be resolved within 15-25 years after 5 year reforms, using only a fraction of the global surplus GDP that USL1 can trigger.) USL 1.0 alone will reduce the annual costs (as a fraction of GDP) to only half (if to resolve all for the first 15-25 years) to less than 1/4 (if to resolve them all in about 25-40 years). These are all essentially to resolve the conflicts between the economic progress vs. the environmental protections sustainability (as well as the social consequences), both extremely rapidly and far more effectively than the conventional modus operandi of the governments and the UN so far (hoping not to offend anyone). Time necessary to overcome them: the minimum of 50 years with the business as usual, including the plans from the UN´s (No offense intended). Instead, we propose USL1-URF1 for resolving them exponentially more efficiently. These are economic and environmental crises (with the social consequences). The current annual operation costs of each of the UN and World Bank (for its delivering loans, etc) is roughly about 0.1% of the world GDP. The annual operation cost for the Millenium Development Goals of the UN has been about 0.3% of the OECD GDP, meaning about 0.2% of the world GDP in recent years (although originally supposed to be 0.7% of the OECD GNI). With the USL1-induced reforms as the world GDP will rapidly increase, we try to double-triple the operation costs of the UN and World Bank by 2030. So the two of the mega projects of the UN (POST-2015 and SE4All) can not only meet their targets, but also achieve 2x, 3x more than currently planning. Please note that this video was made about 10 months ago and a bit out-of-date when USL1 was not pushed and the original version of the USL was pushed. Keeping that in mind, please view it as a blueprint rather than the more updated current USL1 plans and projections. We will try to release the updated video within few months. For some quick visual guides and charts, please click here. For some video (5, 10, 18 minute long) introductions click here. For a 3 page introduction, click here. We are currently compling a working paper series called BOEC (Back Of the Envelope Calculations) Working Paper series which presents with the concise and easy-to-digest approaches primarily targeted for the policy-makers & shapers and the general public so that they can understand the logic and evidences without advanced math or economics (so that anyone with the 10th grade math can understand and at times if integrations or Differential Equations are needed, they are referred to the Appendices and still tried to minimize the complex logic or calculations as much as possible.) You can click it here as we are frequently adding and updating them since January 2015.